The Agile Coaching Track focuses on cultivating the mindset and skills needed for effective facilitation, coaching, mentoring, and teaching an Agile team. You learn the most effective ways to work with Agile teams so they can succeed in self-organisation and deliver consistent value. This track consists of two knowledge-based certifications: Agile Team Facilitation and Agile Coaching. The top-level certification in the track is the ICAgile Certified Expert in Agile Coaching, which demonstrates your ability to facilitate Agile practices while enabling the success of teams and organisations in an Agile environment. Once you’ve obtained the above-mentioned certifications, you can pursue the ICAgile Certified Expert (ICE) certification in Agile Coaching directly through ICAgile. 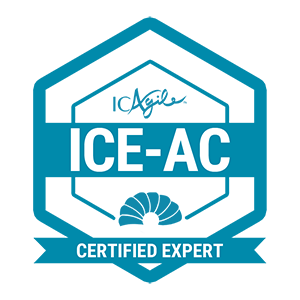 ICE certifications are recognised and respected by Agile thought leaders as an endorsement of genuine competence. They are only awarded to professionals who demonstrate competence real-time in front of an expert panel.